The shooting and death of a state game warden shook up hunters during the 1942 deer hunt. With the rationing of gasoline and ammunition prevalent, those on the homefront wondered that would mean for the upcoming deer hunting season. One thing was clear: of those who were still around to hunt, most would be heading to northern Wisconsin, as they had for years. They would be drawn north for the camaraderie and tradition of the North Woods deer camp, and also because many counties in southern Wisconsin remained closed to all deer hunting due to low numbers. 1942 also marked the first season back tags were required - numbers pinned to the back of a hunter's jacket. With so many hunters expected in the Northwoods, and a new regulation to keep watch over, wardens from the south were sent up to help bolster local law enforcement. Albert Reif, the 33-year-old supervisor of Kettle Moraine State Forest near Milwaukee was one of those department employees assigned to deer season duty in the North Woods. Reif was sent to Florence County to assist game warden Floyd Sanders. Neither man could foresee the great tragedy that would occur just days before the opener. On November 18th, Wednesday prior to opening day, Reif and Sanders were patrolling the woods along the Wisconsin-Michigan border about three miles northwest of Iron Mountain, Michigan, when a gunshot echoed through the autumn woods. Someone was getting a jump on the season they both thought. They immediately proceeded toward the area to investigate. They discovered a man near a 1930 Oldsmobile on a side road about 50 yards off U.S. Highway 2. Reif began a standard interrogation of the man, who was dressed in a blue flannel shirt and whipcord breeches—typical North Woods attire. Sanders took a look at the inside of the car and noticed the back seat was filled with camping gear. But While Sanders was searching the back seat, another shot rang out. Jumping out of the car he saw that Reif had fallen to the ground, shot in the head. The man in the blue flannel shirt was standing there, pistol in hand. “They exchanged shots, the slayer backing into the woods and Sanders following him, dodging from tree to tree,” the Associated Press later reported. Sanders had picked up Reif’s automatic pistol and emptied both his own and Reif’s gun but failed to hit the murderer. Without ammunition, Sanders briefly became the pursued. He escaped by circling through the woods. The man in the blue flannel shirt was able to double back to his car and disappear. When Sanders returned to the scene of the crime he found that the man had dragged Reif’s body into the woods, and the Olds was gone. The manhunt began. As the Associated Press reported the day after the shooting, “Twenty-two Michigan State police and 16 Wisconsin officers in addition to [Florence County] Sheriff Grell’s deputies have been assigned to the hunt, with more officers to arrive today”. Law enforcement combed the woods along the border, and detectives followed up on every lead. The trail grew cold after several false leads. Days went by with no developments in the case. Anxious residents near Iron Mountain began locking their doors at night. Hundreds of deer hunters now in the woods wondered if there was a murderer prowling nearby, watching them perhaps. Ten days after the shooting, the story ended as quickly as it had started. A Michigan fire warden near Sagola realized that a local woodsman, who had gone into town to purchase food, fit the description of the suspect. The man was quickly apprehended. Emil Schroeder, a 46-year-old woodsman and trapper arrested by the Michigan state police, lived alone in a remote cabin. He offered no resistance and readily confessed to authorities. Schroeder recounted that while he was pursued into the woods by Sanders he counted the shots fired until sure the guns were empty, then he doubled back to his car and headed back to his cabin. With a full confession in hand, and a positive identification by warden Sanders, Shroeder was arraigned by Florence County Judge Irving W. Smith and then held in jail to await trial. 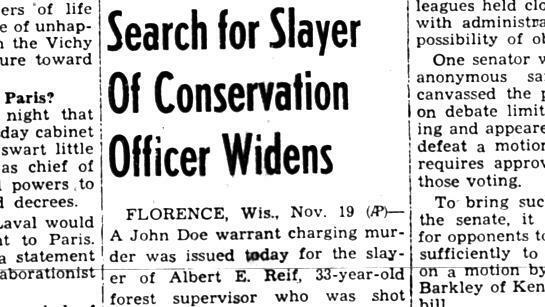 On Sunday, November 29, the 1942 Wisconsin deer season came to a close, and, with Albert Reif’s killer in jail, so, too, did the story of a deer season tragedy. Reif, a native of Switzerland, was buried in Milwaukee, the home of his parents. Reif’s slayer was convicted of second-degree murder and served seven years at the state prison in Waupun. History Afield essays are adapted from the books History Afield and On the Hunt, written by Bob Wilging and published by Wisconsin Historical Society Press. The DNR is asking hunters in two deer units in Vilas and Oneida counties to return some doe tags after they accidentally sold too many. Wildlife management director Tom Hauge says it was human error in data transfer. "...when we started our issuance process it was brought to our attention that the permit numbers we had listed for 'available' were higher than the numbers approved by the Natural Resources Board back in May..."